"Doubloon" token, awarded by RandomDSdevel. "Love" token, awarded by Liuxinyu970226. Ideas of urgency and requiring follow up are mingled, making it difficult to explain or predict why different items are where. Currently, "Alert" items are automatically marked as read on open. Yet some of these require follow-up or other action to be fully understood (e.g., Mention), so this feature's value is not always clear. Because alerts are perceived as Urgent, Thank Yous and other items seem out of place in the Alerts list. To create a scheme that conforms with and facilitates editors goals. To create a scheme that is easy to understand, learn and predict. To give editors clearer information about their new notifications. To reduce unnecessary distraction from non-urgent notifications. Something that works well for editors who get large (and small) quantities of notifications. Something that scales well, as new (requested) notification types are created. To see the current division and three alternatives the Collab team has been working on, please see this spreadsheet https://docs.google.com/spreadsheets/d/1eVQVbzVhhVejEMnVqRBC98weBnfrnZqcGExlImsbBUk/edit?usp=sharing , (or a simplified version below, which does not include a 4th more complex option). The lower half of the spreadsheet shows comments about the pros and cons of each scheme. Ideas of Urgency and Follow up are mingled in ways that are inconsistent, making this difficult to explain or predict. Factor of urgency may provide an aid to triage ("check these first") Ability to automatically mark as read is appropriate and can be preserved. The main shortcoming of this scheme is that it doesn't give users any information about urgency. So, the question is, which would users prefer to be informed about: "I have some items I can dispatch quickly (which this does), or "I have some items that are important" (for which there is no indication). Because some "Alert" items require follow-up and are not self-contained (e.g., Mention), ability to Mark as Read on open is of questionable value Fairly close to current scheme We've discussed adding a "pinning" feature to notifications. When we do, that might make this divsion less valuable. Because alerts are perceived as Urgent, Thank Yous and other items seem out of place. Many of the Urgent (Alert) items require follow-up (e.g., edit-user-talk), so use of automatic Mark as Read is not recommended. Since urgency is not the dividing line, would recommend not using red for Alerts. The team is currently recommending we start off with the "Urgent / Not Urgent" grouping but is waiting for community feedback. There have been alternative suggestions, for adding either multiple colors to the badge ( T57359 and T115845#1750619 ) or multiple icons for the badge (T58476). These ideas are great at a small scale, but they don't expand well regarding the large variety of notification-types, and the contextual-importance of the different types. someone contacting me (ping, talk page, direct reply, thank) vs. software notifying me. Also, i would argue that a revert is not urgent. its usually something that requires de escalation, not faster escalation. for me another important division is: someone contacting me (ping, talk page, direct reply, thank) vs. software notifying me. Hi TheDJ. We tried a version like that in our early discussions. You can see it in this first iteration of concepts for the sorting. But it didn't get much interest from team members and others we showed these early ideas to. Catrope added a parent task: T132525: Remove automatic mark-as-read (of alerts) when you open the popup. 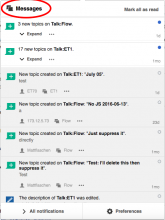 jmatazzoni added a subtask: T132525: Remove automatic mark-as-read (of alerts) when you open the popup. As a reminder, before we make these changes final, we need to remove automatic mark as read T132525, deal with backend changes T132954 and update the badges T115845. jmatazzoni moved this task from Product/Design Work to Ready for Pickup on the Collab-Team-2016-Apr-Jun-Q4 board. Furthermore, Wikibase (Wikidata) is introducing a new notification type called page-connection that is currently planned to be an alert (as it's similar to page-linked) but should be changed to a message once page-linked is also a message. Catrope mentioned this in T114356: Notifications panel: Easily explore bundled notifications. I'm not quite sure if these should all be alerts, but the safest guess seemed to me to make all flowusertalk-* types alerts. @jmatazzoni let me know if this is OK or if this should change. SBisson moved this task from Needs Review to QA Review on the Collab-Team-2016-Apr-Jun-Q4 board. Done in the latest patch set, thanks for pointing this out. 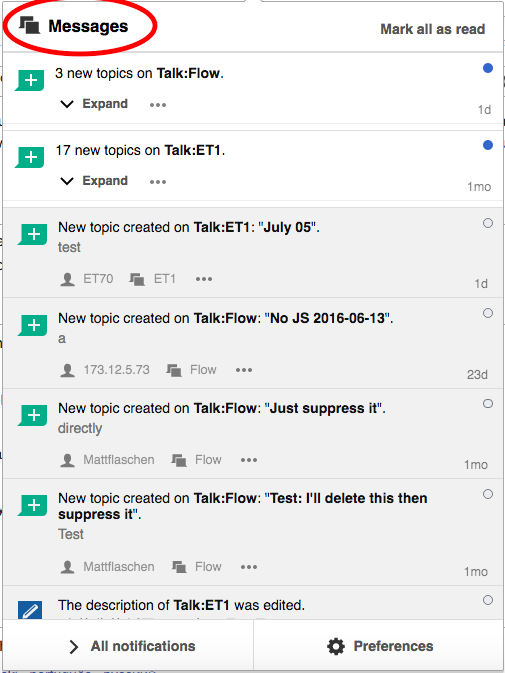 Yes, I would think that the flowusertalk types you ask about (list below) should all be Alerts. Checked the new categorization of notifications as part of general regression testing. No issues have been found. T132525: Remove automatic mark-as-read (of alerts) when you open the popup and T132954: Gracefully handle outdated echo_unread_wikis rows when a notification type has changed categories (alert->message or v.v.) are closed; and there is no direct dependency on T115845: Notification panel: Clearer use of notification badges. @Etonkovidova, did the "Messages" menu get re-labeled as "Notices"? • Mattflaschen-WMF created subtask T139682: Change 'messages' to 'notices' internally (method names and such).